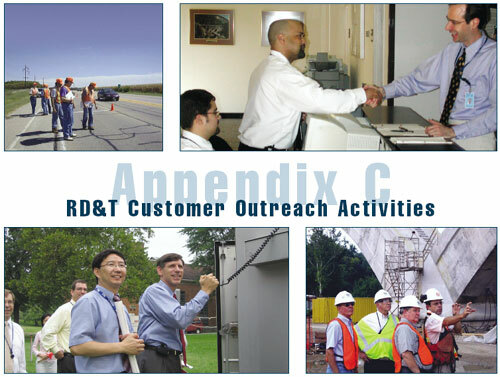 In keeping with FHWA's commitment to involve customers throughout the R&T process, RD&T conducted a number of special outreach activities in FY 2004. RD&T Hydraulics Lab personnel took part in an advisory panel meeting for the Coastal Transportation Engineering Research Center at the University of South Alabama in Mobile, AL on April 23rd. The research center was set up to evaluate models and highway design concepts for coastal storm surges and water quality mitigation measures for storm runoff in the vicinity of coastal waterways. To ensure the best possible coordination and as an important element of the Office of Infrastructure R&D's overall process to regularly communicate with internal customers, the Technical Director for Bridges is a member of the FHWA Bridge Leadership Council. The Bridge Leadership Council is a crosscutting group of FHWA bridge engineers, representing the entire FHWA bridge community including the Division office; the Resource Center; Federal Lands Highway Division; the Office of Research, Development and Technology; and the Office of Infrastructure. Researchers at FHWA are conducting a series of tests on models of box culverts in the Hydraulics Laboratory at TFHRC. Designers and researchers from the South Dakota DOT and representatives from the concrete industry observed and evaluated the tests. Results of the research will be used to make design manual updates and to improve analysis programs. FHWA and the National Concrete Bridge Council (NCBC) held their annual meeting at the TFHRC in FY 2004. The meeting is a forum for sharing information and identifying opportunities to support and advance concrete bridge technology and to help improve communication and collaboration between FHWA and the concrete bridge industry. At the meeting, the two parties discussed the status of activities such as the Innovative Bridge Research and Construction (IBRC) Program, ultra-high performance concrete research and projects, implementation of specifications for load and resistance factor design, accelerated bridge construction technologies, and legislation and funding for various bridge projects across the country. The Next Generation Simulation (NGSIM) project will develop a core of driver behavior algorithms that are freely open to the public to foster the improvement of the baseline accuracy and validity of microscopic traffic simulation models. To ensure that NGSIM products meet the needs of the simulation community, three stakeholder groups were formed: simulation modelers, simulation users, and simulation developers. Each group contains approximately 10 to 15 leading experts in the field of traffic simulation. Annual workshops and bi-monthly teleconferences are held to allow the stakeholder groups to provide meaningful insight and guidance to the NGSIM project. Visibility of wet pavement markings and raised retroreflective pavement markers. Staff from RD&T in conjunction with the Resource Center facilitated five Roundabout Workshops in December 2003. The workshops provided information on design, operation, and safety benefits of roundabouts. In addition, the sessions provided practical examples and hands-on applications of geometric designs for single- and double-lane roundabouts, and covered methods for assessing the capacity of single and multilane roundabouts. About 160 designers, traffic engineers, researchers, and planners from FHWA, VDOT, the city of Richmond, Henrico County, VA, and several consultants attended these workshops. Publication of the report titled "Development of Critical Knowledge Gaps and Research Efforts" was another step in the process to create a national working research and technology agenda for all parties involved with the infrastructure and operations aspects of highway safety. The report presents a set of five independent white papers on topics selected by the National Safety R&D Partnership, including a comparison of expected results from the research across the white papers and a review by a group of experts. Each potential project was rated for likelihood of success, estimates of cost and duration, and most importantly, a distinction between applied or advanced. The report will be reviewed by a TRB oversight group for consideration into a final recommended highway safety R&T agenda. HRDI tested several concrete beams for VDOT in the Structures Laboratory. The beams were fabricated from SCC, a type of concrete that allows casting without the need for vibration. TFHRC was selected by VDOT because of its unique capabilities and expertise for full-scale testing. Performing the service for VDOT provided TFHRC researchers the opportunity to assist VDOT while adding to their own knowledge regarding this innovative material. RD&T researchers provided technical expertise on roadway design, highway engineering, and driving simulations to DHS for the purpose of developing a state-of-the-art Driver Training Range at the Federal Law Enforcement Training Center (FLETC) in Cheltenham, MD. The range will be used to train law enforcement officers in driving skills under stressful scenarios. FHWA has offered FLETC its skills in roadway design and highway engineering to improve the driving range, as well as expertise in driving simulation to enhance law enforcement simulator training. In addition, RD&T researchers successfully designed antiram barriers (bollards, fences, walls, etc.) using computer simulation technology and actual crash testing to enhance facility protection and structural design. The Office of Infrastructure R&D conducted a seminar on "Investigations into the Nanostructure of Alkali-Silica Reaction Products." The seminar was part of its Technical Seminar Series and covered the alkali-silica reaction (ASR) in concrete, novel experimental techniques, and advanced methods used to characterize ASR gels.